You will probably ride trains on your trip to France—and you'll be happy you did. It's usually fairly easy and convenient to travel among French cities and towns, and even some villages by train, or train and bus. Train equipment is mostly well-designed, modern and comfortable. Most train stations (gare) were built in the 19th century, and are thus near the historic centers of French cities even though the cities may have grown well beyond their 19th-century boundaries. Large cities may have more than one train station (Paris has more than seven). TGV high-speed trains may have their own special station some distance from the traditional station. It's common to find a useful selection of hotels near the train station, some older, but many of late 20th-century or 21st-century vintage. All but the smallest stations have snack and refreshment shops, though only the larger stations are likely to have sit-down restaurants. Tourist offices are commonly (but not always) located in, next to, or near train stations, making it easy for you to pick up maps, street plans, brochures, and to get help finding things or making hotel reservations. In cities and towns with municipal bus and tram systems, important bus and tram lines always start at, or pass near, the train station, helping you to get where you want to go in larger cities. 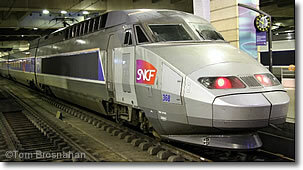 An SNCF TGV high-speed train locomotive in Paris.